Having been chased away by the police from staging a dharna at the mini-secretariat here, the protesting activists of the Multi-purpose Female Health Workers Union today made a vain bid to block traffic at Bharat Nagar Chowk on the Ferozepur Road here. Necessity is the mother of invention. The wish to have bicycles fitted with motors to make cycling easier, besides a technical bent of mind, encouraged students to make a prototype of a bicycle for a project in the production engineering course at Guru Nanak College of Engineering and Technology. One person sustained bullet injury after an armed assailant opened fire at him in the Pritam Nagar area of Haibowal here this evening. The rural sport kabaddi has done what the tall claims of politicians could not in all these years. The Kabaddi World Cup final, to be held on November 20, has given a new lease of life to Guru Nanak Stadium that has been crying for attention. Players of sports other than kabaddi are feeling that the state government has been partial towards kabaddi players. While on the one hand, the government is spending huge amount of money on kabaddi, and on the other hand, the players of other major sports, despite their extraordinary achievements, are yet to get a similar treatment and facilities on a par with kabaddi players. While the police is ensuring that no liquor and tobacco product enter the Guru Nanak Stadium during the Kabaddi World Cup final to keep the sanctity of the sport, employees of the event management company were seen smoking inside the stadium. A family of Agwar Lopo locality of Jagraon has approached Jagraon SDM Isha Kalia and complained against a famous sweet shop owner of the city for selling fungus-infested sweets to the family. With the state Assembly elections just round the corner, dinner diplomacy seems to have begun in the Shiromani Akali Dal (Badal). Last evening, around a 12 leaders from the district, who are either sitting MLAs, former MLAs or prospective candidates, were invited at Badal village for dinner with the Deputy Chief Minister Sukhbir Singh Badal. The Punjab Health and Family Welfare Minister Sat Pal Gosain today inaugurated the new maternity ward at the Civil Hospital here. With this, the total bed strength of the maternity ward has gone up from the existing 16 to 36 beds. Ahead of the state assembly elections and the model code of conduct all set to come into force in the state by November end, the Ludhiana Municipal Corporation has fixed November 25 for holding the general house meeting of the civic body. Though Chief Minister Parkash Singh Badal has distributed bicycles pasted with his photographs among girl students under the Mai Bhaggo Scheme, but he has failed to find a place in their heart. It was a heart rendering scene at Mullanpur village near Khanna where head constable Harjit Singh who died in a road accident yesterday was being cremated. He died yesterday while escorting women Kabaddi players near Bathinda. A 25-member delegation of the National Bank for agriculture and Rural Development (NABARD) visited Guru Angad Dev Veterinary and Animal Sciences University. The delegation comprising top officials of the bank along with 15 district development managers of different districts of Punjab, witnessed different projects of the university. Message of peace and unity given by Shubham and Vanshaj (pair from the age category 10-14 years) and group on the theme of Mumbai bomb blast through their dance performances touched choreographer Saroj Khan’s heart and left the audiences spellbound. The ETT teachers’ union is going to distribute anti Akali -BJP government leaflets in the final match of the ongoing Kabbadi World Cup at Guru Nanak Stadium, Ludhiana, on November 20. The teaching and non-teaching employees of private colleges continued their protest against the apathetic attitude of the Punjab Government to their long-pending demands. Prof. VK Bhardwaj, vice-president of PCCTU said that the Punjab government was backtracking from its promises made in the election manifesto of both the ruling political parties the SAD-BJP combine. "These were not meant to be design statements when they were created, but because of their perfect proportions and excellent design, they have emerged as the finest examples of great architecture," says architect Sukhtej Gill, who is holding a 10-day photographic exhibition named “Two Houses Two Architects at Artmosphere Art Gallery”, juxtaposing two of the best-designed houses in the last century by the stalwarts of architecture - Frank Lloyd Wright and Le Corbusier. 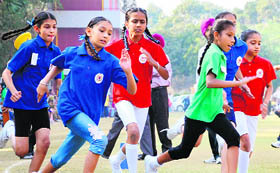 KVM celebrated the sixth recreational meet. Various playway schools of the city were took part in it. Obstacle race, pull along race, sand race, giraffe race and balloon game, brisk walk for the parents were organised with cultural bonanza adding spice to the whole event. The winners were duly awarded. 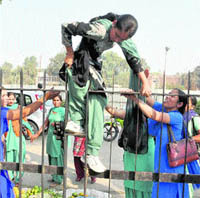 The Government College for Women, celebrated 150 years of Kuka Movement in Punjab on Friday. This function is being organised under the guidance and direction of the Punjab Government. Some unidentified thieves broke into a Karyana store at Ishar Halway Chowk, Jagraon, last night and decamped with Rs 50,000 cash and two gold bangles weighing 20 grams. The incident came to light this morning when the shop owner opened the shop and found the locks of the drawer in which he had kept the cash broken. While emphasis is being laid on the stage performance of Bollywood stars, kabaddi seem to be taking a back seat.